So, you want to get a filter for your drinking water, right? But maybe you don't want something you have to refill all the time, and you don't want the hassle of installing a system to your plumbing. If that's the case, you'll want to check out the countertop water filters in this review. All of them sit on the counter next to the sink. They connect to your kitchen faucet and provide clean filtered water on demand. No refilling, and no messing with the plumbing. Sounds interesting? Keep reading to learn more about these filters. First you'll find a comparison table for a quick overview, followed by an explanation of how these filters work, the pros and cons, and a list of what to look for when you're shopping for one. Then we'll look at each filter individually, giving special attention to how well they reduce the contaminants that most people are worried about. By the way, if you're looking for a fluoride filter, you'll be glad to know that some of these filters do reduce fluoride. Rather than keep you in suspense, I'll tell you right now - the top pick is the Propur Countertop System with ProMax Filter. You can check the availability and price at Amazon here or go straight down to the mini review. Countertop Gravity Filters: Which is Best? If you're in a hurry and don't have time to spend reading the whole article, you can skip to whatever interests you most using this quick navigation. What are the advantages of countertop water filters? What are the disadvantages of countertop water filters? Countertop vs faucet mount filter: Which is better? What should I look for in a countertop water filter? Verdict: What's the best countertop water filter? All of these models have a tube with an adapter on the end to attach to your kitchen faucet. You simply remove the aerator from your faucet and screw the adapter on in its place. When you turn on the cold water, it goes through the tube and is forced through the filter and out the dedicated faucet. That faucet is attached to the unit itself. The unit is designed to sit on the counter. You want to position it so that the water outflow goes into the sink. There is no switch on the filter faucet. You simply turn the water off and on with the sink faucet handle. A diverter allows you to stop the water from going through the filter and lets it just come out the sink faucet instead. That will keep you from wasting filtered water on dish washing and things like that. You just have to be careful and make sure that the diverter is switched off when you turn on hot water because hot water will damage the filter. Convenience - There's no container to refill and no waiting for the water to drip through. Just turn on your faucet and get clean filtered water instantly. Easy Installation and Maintenance - These filters are simple to install and easy to maintain. You can be up and running in a matter of minutes. And there's no maintenance to speak of, except changing out the filter every now and then. Space Saving - Most units take up less than 6 inches of counter space next to your sink. And you won't lose any of the precious space under your sink, like you do with undersink systems. 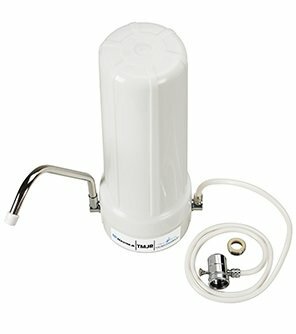 Inexpensive - You can get a decent water filter for under $100, although the best ones are going to cost more like $200. That's still cheaper than a whole house system or a lot of the gravity filters. Effective - Most of the brands will reduce some of the worst contaminants in drinking water supplies like chlorine and lead. Some do a lot more than that, though. Portable - Moving? Going on vacation? Just unscrew the tubing from the faucet and take your filter with you. It's also a good option if you live in an apartment or dorm where you can't make changes to the plumbing. Standard Faucet Only - If you have a pull-out or pull-down kitchen faucet, you're out of luck. These filters can only be attached to standard faucets. Awkward Tubing - Keep in mind that the tubing is going from the end of the faucet over to wherever you have set the unit. It has the potential of getting in the way of whatever you're doing in the sink. It also doesn't look great, if that matters to you. Limited Effectiveness - These small filters aren't designed to eliminate as wide a range of contaminants as some of the larger systems. They also can't be used in emergency situations. All of the manufacturers state that their filters are only to be used with treated water. Faucet mount water filters are convenient and cheap, but they're not as good as countertop filters. Because they attach directly to the faucet, there's a lot of of pressure from the water, and they have a tendency to crack and leak. The countertop models are much sturdier, and the filters last longer. Most of them remove a wider array of contaminants, too. Given the choice, I would go with a countertop rather than a faucet mount filter. All countertop water filters are not the same, so you'll want to take a close look at them before you decide which one to buy. 1. Which contaminants are removed and how much are they reduced? This is where water filters differ the most. All countertop filters are going to, at a minimum, take out chlorine and make your water taste better. But if you're concerned about other toxins like lead, arsenic, fluoride, chemicals, and biological contaminants, you're going to want to dig a little deeper. You should find out exactly which contaminants a filter eliminates, and what percentage of each is removed. Go for a filter that reduces at least 90% of the toxins that concern you the most. Some manufacturers publish third party lab test results on their websites, but many do not. If they are not willing to share this information, it tends to make me question the validity of their claims. 2. How long will the filter last? No matter which brand you choose, you're going to have to change out the filter element every now and then. Each product listing gives the average filter life (or capacity) either in gallons or months/years. Note that this is an average. Your mileage may vary depending on the quality of your tap water and how much water you use. The filter life is an important factor in determining your overall cost. A more expensive system with a longer filter life may end up costing less than a cheaper system whose filters need to be replaced every few months. 3. Is it easy to find replacement filters? Before you invest in a water filtration system, make sure that you'll be able to buy replacement filters when you need them. Otherwise, you'll end up having to replace the whole thing. Generally, the retailer you buy the system from will also sell the replacement filters. Just make sure before you make the purchase. Some manufacturers have filter replacement subscription services, and some replacement filters are also available through Amazon Subscribe and Save. You can tell a lot about a company and their confidence in their product by the warranty they offer. If they don't guarantee it for at least six months, I would steer clear of it, myself. Now let's take a more in-depth look at the top five countertop water filters. These five were selected based on performance and user experience. We'll start with the Number One Pick - the Propur Model PMC-3000. 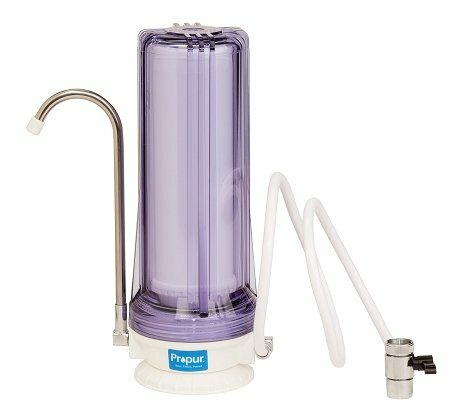 This system is one of the newest offerings from Propur, an American company that also makes an excellent countertop gravity filter as well as other water purification products. It might look like a lot of the other filters, but don't let that fool you. Yes, this system is a bit pricey compared to the others, but it really is a cut above. The difference maker is the ProMax filter, which you can see inside the clear cover in the picture. It reduces over 200 contaminants up to 99.9%, including chlorine, chloramines, fluoride, lead, arsenic, VOCs, PCBs and other pesticides, pharmaceuticals, certain micro-organisms, and a whole lot more. You can see the complete list and independent lab test results here. And let me say right here that I place a high value on a company's willingness to share this kind of data with the public. How else are we, as consumers, supposed to make intelligent choices if we don't have all the facts? The filter will need to be replaced about once a year. You'll know it's at the end of its life when the flow of water slows down a good bit and/or you start to notice an off taste or odor. Click here to check the price of the replacement filter at Amazon. Propur also offers a dual stage version of this system. It has a pre-sediment filter that blocks particles like dirt and rust from getting into and damaging the ProMax filter. It costs about $30 more to get the extra filter, but it's worth it if your water tends to have debris in it from older pipes or from a well, or if you just want the extra protection. And the replacement filter is very inexpensive. Click here to check the price of the dual stage system at Amazon. The system comes with a one year warranty on the unit (housing, faucet, tubing, etc) and a 9 month warranty on the filter element. Well, a quick Google search turned up several online retailers that sell this filter. Click here to go to Amazon to check the current price and read the reviews. You might prefer to buy directly from Propur. They have free shipping and they have a variety of ways to, including PayPal. And sometimes they run special deals. It might be worth checking out. Click here to buy the countertop system at the Propur website. Home Master is one of the brand names manufactured by Perfect Water Technologies, a company located in Arizona. They started out with reverse osmosis systems and have expanded to include many different types of water filters. 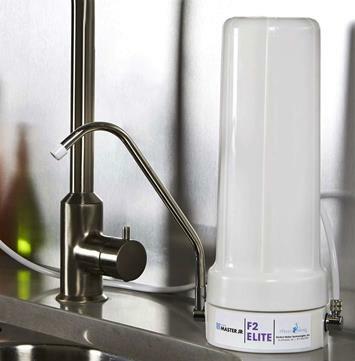 The TMJRF2E is one of several countertop filters made by Home Master. Of those, it's the best overall in terms of contaminant reduction. Contaminants are said to be reduced up to 93%, but there is no data available to verify exactly how much each is reduced. I emailed the manufacturer requesting lab test results, but as of this writing, I haven't heard back from them. 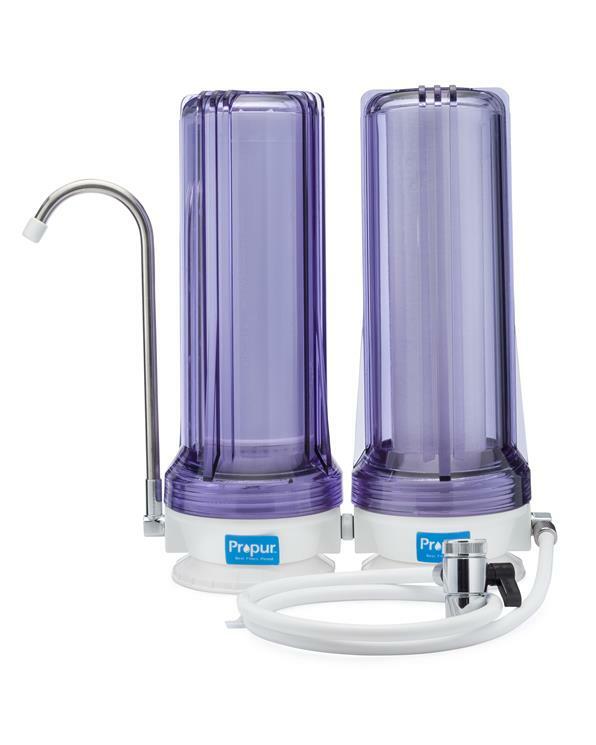 Unlike the Propur filter, this one does not reduce micro-organisms like giardia and E. coli. Home Master is slightly better at fluoride reduction than Propur (93% vs 90%), but the filter can only work on fluoride for 3 months. It will continue to reduce other contaminants for up to about a year, or 750 gallons. So, if fluoride is a major concern to you, this might not be the best choice. You're going to have to replace the filter four times a year! This ends up being more expensive than replacing the Propur filter annually. You can check the price of the replacement filter at Amazon here. 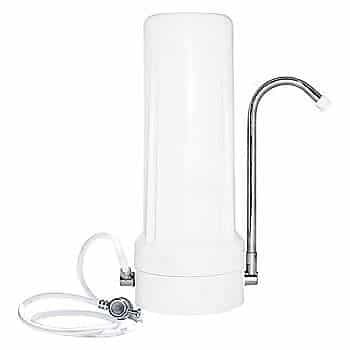 This model comes with a 3 year warranty, which is great for a small water filter like this. And, you might like to know that this model comes black as well as white. Click here to go to Amazon to check the current price of the Home Master TMJRF2E and read the reviews. To avoid any confusion, note that there is a model TMJRF2 - without the "E" on the end. It looks identical to the TMJRF2E, but the filter is different. It does not have KDF85, and it does not reduce chloramines. The price difference is negligible, so you'd be better off with the "E" version. 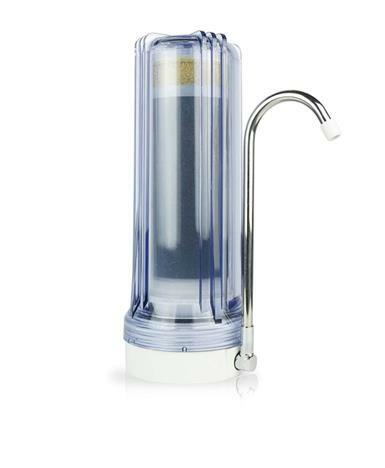 Now here's the APEC RO-CTOP - a water filter that's quite different from all the others. That's because it's actually a reverse osmosis system. I wanted to include it because it sits on the countertop next to your kitchen sink and uses water from the faucet just like all the others do. You may know that reverse osmosis is one of the most effective ways to purify water. 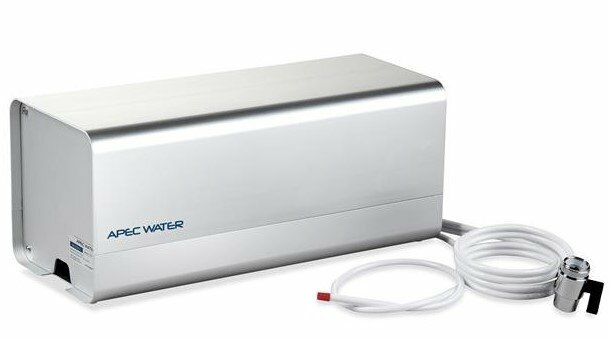 It removes up to 99% of many kinds of contaminants - lead, chlorine (but not chloramines), fluoride, VOCs, heavy metals, bacteria, viruses, and more. it also removes healthy minerals from the water. it wastes water as part of the filtration process. it's somewhat expensive to buy the system and to replace the filters. You might notice from the picture that there's no faucet with the RO-CTOP. See that long piece of tubing with the red tip? That's where the filtered water comes out. And it comes out slowly. You might get about two gallons in an hour if you're lucky. The system is made up of four separate filters, or stages. They don't all have the same capacity. Stage 1 and 2 filters need to be replaced every 6 to 8 months, and Stage 3 and 4 will last for 2 to 3 years. If you buy one of these, you'll need some way of remembering when to replace which filter. Check the price of the Stage 1 and 2 replacements at Amazon here. You can't buy the Stage 3 and 4 filters separately. They only come in the complete set of Stages 1-4. That's okay because by the time you have to replace Stages 3 and 4, you're also going to need another set of Stage 1 and 2 anyway. Check the price of the complete replacement filter set at Amazon here. 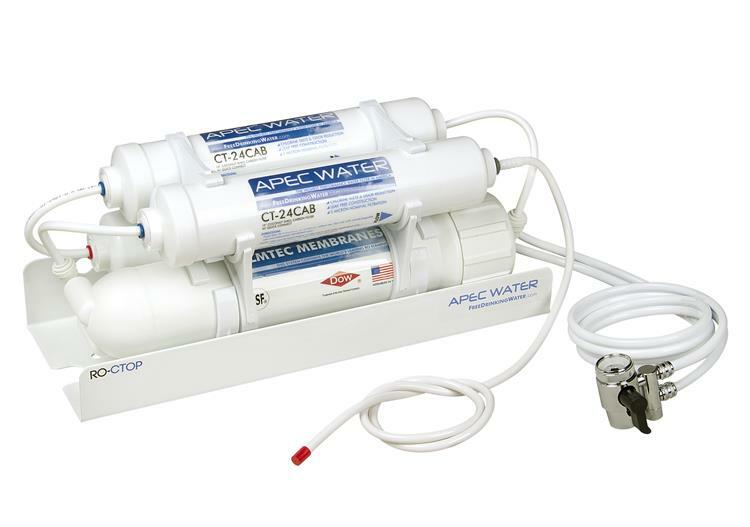 If country of origin is important to you, you'll be glad to know this APEC water filter is made in the USA, and the company's customer service department has a great reputation. ​​​​It comes with a 1 year warranty. Click here to go to Amazon to check the price and availability of the APEC RO-CTOP. Next up is the MR-1050 from APEX Water Filters. This filter doesn't just take contaminants out of the water. It also adds minerals to make the water more alkaline. APEX products are made in the USA, in California. Although the system itself isn't NSF certified, the materials used in the manufacture of the system are NSF and FDA approved. This is a five stage filter, and it reduces a wide variety of contaminants. It uses KDF-55 and granular activated carbon (GAC) to reduce chlorine, chloramines, pesticides, lead, arsenic, and other heavy metals, as well as E. coli cryptosporidium, and giardia. Exactly how much of these contaminants are reduced? That I can't tell you. I emailed the manufacturer to ask for the data. All they would tell me is that the system has been tested. Whether that's a third party lab or their own lab is unknown. We do know that the APEX MR-1050 does not reduce fluoride. It says so on their website. This filter doesn't remove beneficial minerals, but some people want an extra boost. Two of the filter stages use "Alkaline beads" and calcite to add calcium, magnesium, potassium, and sodium to the water as it passes through. Filter life is about 750 gallons, so you'll have to replace it about once a year. Like all the others, you'll know it's time when the water starts to taste or smell funny or the water flow slows way down. Click here to check the price and availability of replacement filter cartridges at Amazon. Are you into color coordination? Then you'll like this - the outer case of the MR-1050 comes in six different colors plus chrome. The prices vary, so pay attention when you're ordering. As far as warranty goes, they say, "If for any reason you’re not completely satisfied with an Apex Water Filter, we’ll replace it or refund the purchase price–no questions asked." This sounds good, but I'd prefer to see warranty terms spelled out. They do have a 30 day money back guarantee, but that's only on unopened products. And you have to pay for return shipping unless it was their mistake and not yours. Check the price of the APEX MR-1050 and read the reviews at Amazon. Finally, we have the 10 Stage Plus Water Filter System from New Wave Enviro, a company based in Colorado. Inside the filter are ten different layers of various filtration media that reduce different kinds of contaminants as the water flows through. Some of the contaminants it reduces are chlorine, arsenic, lead and other heavy metals, pesticides, and herbicides. It does not reduce fluoride. This video from New Wave Enviro describes the ten stages and what they do. Unfortunately, there is no data available about how much these contaminants are reduced. They don't even give a ballpark figure like "reduces up to 90%" like other brands do. That just seems a little odd to me. I reached out to New Wave Enviro via email, asking if they had independent lab test results that would validate their claims. To date, I haven't heard back from them. If I do, I will update the information here. The filter in this system is supposed to last for 1500 gallons, or about one year for a family of four. That, of course, depends on the quality of the water you're starting out with. Check the current price of the New Wave Enviro replacement filter cartridge at Amazon. This system comes with a one year limited warranty on the hardware and a 30-day money back guarantee. If this filter does what it says, and if you don't want a filter that takes out fluoride or that adds minerals, this might be a good choice. Fluoride can be removed with reverse osmosis, distilling or with activated aluminum. The 10 Stage does not contain activated aluminum, as it tends to dump in high concentrations of aluminum. Enviro Products has also chosen not to use activated aluminum due to the link between aluminum and Alzheimer’s Disease. First of all, it's not activated aluminum, it's activated alumina. Activated alumina is not the same thing as aluminum. It's a solid made of aluminum oxide and is not harmful to humans or the environment. As you can probably tell, I'm not totally sold on this water filter. That's why it's last on the list. But it does seem to be popular and has a lot of happy customers, so I thought I ought to include it. You might want to check it out. Check the price of the New Wave Enviro 10 Stage Water Filter System and read the reviews at Amazon. All of these countertop systems are worth considering. But, if you want my opinion - and I assume that's why you're reading this - I'd say that the best one is the Propur PMC-3000 water filter. Because it does a superior job of reducing all of the contaminants that you need to be concerned about in your drinking water, including fluoride. And, it has the data to prove it. The manufacturer is well known and reliable, and they offer a good warranty on their product. The Home Master is second because, although it does reduce fluoride, the fluoride protection only lasts for three months. It does have the best warranty, though. The APEC RO-CTOP is also very good. If you'd prefer a reverse osmosis system, then I'd recommend that one. And, if your water comes from a fluoridated water supply, and you want to keep the fluoride, then you'll want to consider either the APEX MR-1050 or New Wave Enviro. I hope you found this review helpful. Please feel free to ask any questions you might have in the comments below. If I don't know the answer, I'll do my best to find it for you.